Learning to Listen – why is it important? It all starts with being able to listen precisely! Nancy Caleffe-Schenck, well known Auditory Verbal Therapist and Listening and Spoken Language Specialist has given permission to share her Activities for Listening and Learning (ALL). The ALL is unique in that it provides not only goals in the auditory development area but also for communication, reading and vocabulary. I also have adapted this into an ALL Goal Bank and Performance Checklist format, with Nancy’s permission, so that it can be easily used for goal-setting during IEP team meetings and to monitor progress. Auditory skills of children who are hard of hearing do not develop at the same rate or in the same way without specific teaching. The following checklists will guide interventionists and family members as they assess and build these important skills. Sound Foundation for Babies and Toddlers Cochlear Corporation has a suite of resources to assist with listening and language development from birth to 6 years of age. Free download! The Sound Foundation for Babies resources is an awesome resource by Cheryl L. Dickson, that offers week by week activities that can be shared with families as a recommended website, or to augment activities discussed during early intervention. Each week includes a video tutorial and attention specific to audition, receptive/expressive language, speech, songs, rhymes, etc. Sound Foundation for Toddlers was created by Nancy Caleffe-Schenk. Thanks to Cheryl and Nancy for these powerful and easy-to-use materials! Auditory Skills Checklist Auditory skills develop sequentially in a hierarchy of increasing complexity. Most children without hearing loss will develop all but the most complex listening tasks by school entry, improving in their ability to listen in noise as their brain matures – until age 13-15 years. Children with hearing loss typically require attention to auditory skill development if they are to learn all of the skills in the hierarchy, especially if they are to compete with typically hearing peers in a classroom. Good technology and consistent use is a critical factor in the natural development of auditory skills, but cannot guarantee progress of skill development without specific attention. Early literacy is primarily based on auditory skills making attention in this area a priority. The Auditory Skills Checklist is a simplified summary of auditory skills, broken into 10 levels, each with 4 skills and examples. It is useful to track progress on auditory development as a part of early intervention over time. Auditory Skills Checklist – Cincinnati Children’s Hospital Medical Center is in an interview format that asks parents to rate skills in terms of whether their child often, sometimes or never/rarely displays use of the skill. Examples are provided to make the questions easy to understand. A numeric score is obtained so that use of this checklist over time will show progress in achieving the skills. Thanks to the Cincinnati Children’s Hospital for sharing this resource for use on Supporting Success! Functional Auditory Performance Indicators (FAPI) was developed in Colorado by Arlene Stredler-Brown and Cheryl DeConde Johnson (2001, 2003) and provides a step-by-step checklist of what to look for, and what to work on next, in developing functional auditory skills. A ‘staple’ in many early intervention and early childhood programs for children with hearing loss. 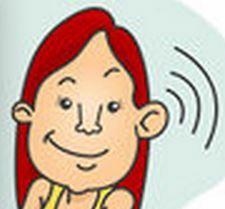 Track a Listening Child is one of the Cochlear Corporation suite of resources for 0-36 months. Attractive and engaging for families.